Photograph by: Robert H. Mohlenbrock. USDA NRCS. 1995. Northeast wetland flora: Field office guide to plant species. Northeast National Technical Center, Chester. Courtesy of USDA NRCS Wetland Science Institute. A 100g bottle of Tombo Jirushi Junsai - the unfolded leaftips of this plant. Brasenia schreberi is a floating, perennial plant producing stems up to 2 metres long. ]. The plant also has an edible root and various local medicinal uses. Brasenia schreberi has a very wide range, being found from the temperate to the tropical zones. Seed - no details have been found for this species. 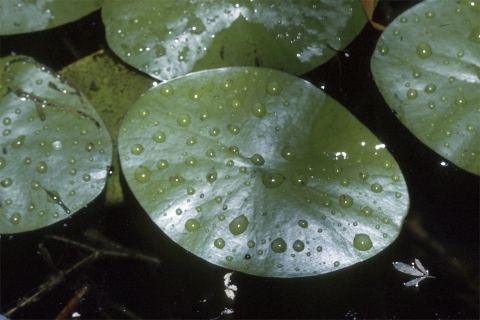 Seeds of many water plants have a short viability if allowed to dry out so it is probably best to sow the seed as soon as it is ripe or to store it in water until the spring and to sow then. When they are large enough to handle, prick the seedlings out into individual pots and grow them on until large enough to plant out.